'A true circumnavigation of the world must pass through two points antipodean to each other.' Norris McWhirter, founding editor of Guinness, 1971. '[A] true circumnavigation of the world ... where the track passed over 2 points antipodean to each other ... a circumnavigation where the vessel passes through two points on the earth's surface which are diametrically opposite each other ...' Sir Francis Chichester, Gipsy Moth Circles the World, 1967. '[A] true circumnavigation of the Earth must: start and finish at the same point, traveling in one general direction, reach two antipodes, cross the equator, cross all longitudes, cover a minimum of 40,000km..' Explorers Web AdentureStats, 2007. THE FIRST CIRCUMNAVIGATION OF THE GLOBE passing through antipodal points was completed in 1522 by 18 members of Ferdinand Magellans expedition to find a route to the Spice Islands by sailing west. Magellan himself was killed en route on the island of Mactan in present day Philippines. Francis Drake, Thomas Cavendish and Simon de Cordes, to name but a few, soon followed in the same manner: under SAIL. > Reach two antipodes (Two diametrically opposite places on Earth). The word circumnavigate is based in geometry and means to travel around something, like a continent or the earth. The circumnavigation should by definition be around the entire object, or what is called a 'great circle'. The great circle distance on Earth is roughly 40,000 km; marking the minimum distance needed for the label 'circumnavigation of the earth'. Norris McWhirter (founder of Guinness World Records) and Sir Francis Chichester (first solo circumnavigation by sailboat) had the foresight early on to recognize that the cleanest and most efficient way to measure a circumnavigation by any means of propulsion was for the track to pass through at least one pair of antipodal points; two places on the surface of the globe that are diametrically opposite to each other. 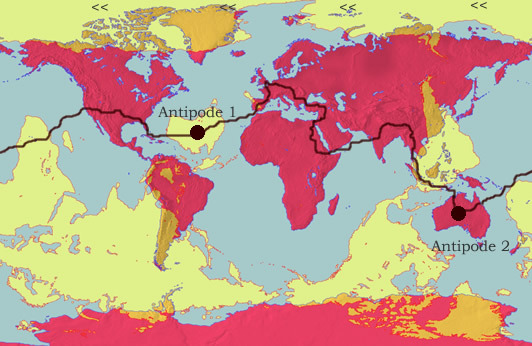 To cross a pair of antipodal points means automatically crossing and traveling the minimum distance of the equator, and spending equal time in both southern and northern hemispheres. Any other attempt at quantifying a circumnavigation inevitably involves a complicated combination of criteria such as minimum distances achieved, minimum number of oceans/landmasses crossed, minimum meridians crossed etc, and as such is inherently open to persistent manipulation and dispute. For a more detailed explanation of Antipodes and Great Circles, click here. > Over 100 finishers of the Whitbread (now Volvo) Round the World Races. > The Jules Verne record holders and most if not all of the finishers of the Vendee Globe Challenges. > In May, 2008, Adrian Flanagan of the Alpha Global Expedition achieved the first single-handed "vertical" circumnavigation by sailboat, taking in a pair of antipodes en route. > The earliest was by 2 US army Douglas DWC amphibians in 57 'hops' between 6 April and 28 Sept, 1924 beginning and ending at Seattle, Washington State. The 'Chicago' was piloted by Lt. Lowell Smith and Lt. Leslie Arnold, the 'New Orleans' by Lt. Eric Nelson and Lt. John Harding. Their flying time was 371 hrs, 11 minutes. Erden Eruc of Around n Over reached no fewer than twelve pairs of antipodes en route, completing the first self-propelled circumnavigation of the world. > GUIDELINES on circumnavigation by human power by Explorers Web Inc.
> The Alpha Global Expedition aims to achieve the first ever single-handed ‘vertical’ circumnavigation by sailboot. Find out the latest news on Adrian Flanagan's progress.